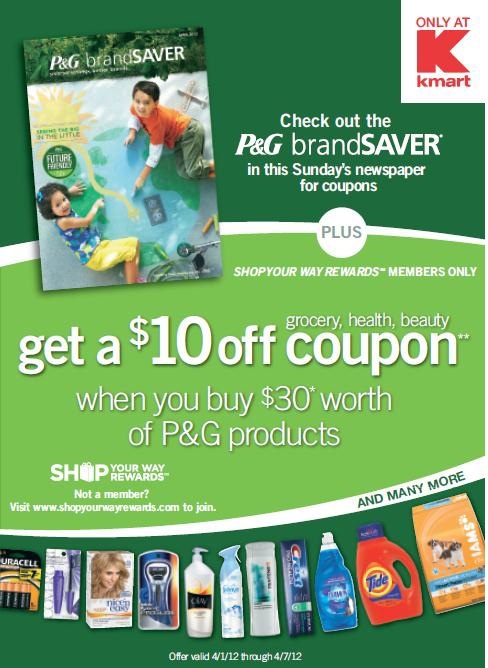 * If you purchase $30 worth of P&G products during the week of April 1 through April 7, the $10 off coupon is redeemable April 8th through April 15. 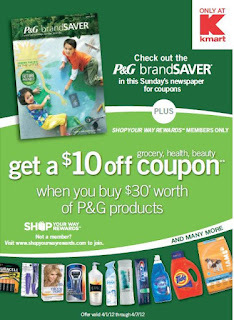 * If you purchase $30 worth of P&G products during the week of April 15 through April 21, the $10 off coupon is redeemable April 22 through April 28. This deal will be offered to Kmart customers via the Shop Your Way Rewards program, Kmart's loyalty program that lets customers earn and redeem points at Sears, Kmart, Lands' End, Sears Home Services, Sears Auto, the great indoors and mygofer. * Olay Facial Hair Removal Duo. Leave a comment on this post telling me what you would buy at Kmart if you won. This entry must be completed before any extra entries will count. 3) Leave a comment on this post and tell me your favorite P&G product (1 entry). This giveaway ends at 11:59PM PST on April 8, 2012; I will draw a winner at random on April 9 and post his/her name after she/he confirms acceptance. Continental US residents only. For additional giveaway rules, click here. Good luck! Disclosure: Procter & Gamble is providing me with giveaway prize pack, as well as a second prize pack to me as a thank-you for posting this information and hosting the giveaway. Promotion details were provided by Procter & Gamble via Blue Chip Communications and are indicated in italics. The views and opinions expressed here are my own. Favorite P& G product: Pantene shampoo. If the frame isn't locked to the tire a thief could remove the front tire and get away with your bike. Probably some Easter stuff for kids. Would like to buy some fishing stuff. I would probably buy some Tide and paper towels. I would buy summer clothes for my sons. My favorite product would be Tide Free! Laundry detergent. In fact I need some now (lol)! Congratulations to the winner: #109, mari!